During his freshman year in college, the executive director of the David Lynch Foundation and meditation teacher Bob Roth (@meditationbob) worked part time at a Swenson's ice cream store. One of Roth's co-workers seemed to radiate an unusually strong peace and calmness, an observation that led him to learn and teach Transcendental Meditation. I was not a hippie, I did not take drugs and I was not interested in the plethora of new sects and new age philosophies that were sweeping through town. But I was disoriented and stressed. Really stressed. I had a part time job at a Swenson’s ice cream store—the only job I could find that fit my class schedule. And amidst all the clean-cuts and longhairs and jocks and crazies that either worked or frequented that store there was one guy I worked with, Peter Stevens, who was like a calm reflecting pool. Peter was centered, energetic, super-smart, kind to all, easy going, never agitated, with an ineffable calm about him. I found out, rather serendipitously that he "meditated." It sounded discordant to me. In my activist-centric world of "If you are not part of the solution you are part of the problem," meditation was not in my vocabulary. But I was intrigued and curious, and then grew open when he told me there was nothing to believe in. And equally attractive to my busy, busy mind: he assured me it was simple, easy, and I could actually do it. Cautiously but bravely (I had never gone to learn something like meditation before), I attended an introductory talk on the technique. A nice, well-dressed man spoke for about 45 minutes. He said a few things that struck me. He said Transcendental Meditation gave the experience of a deeply settled, peaceful state of awareness that already existed at all times deep within the thinking mind of everyone. 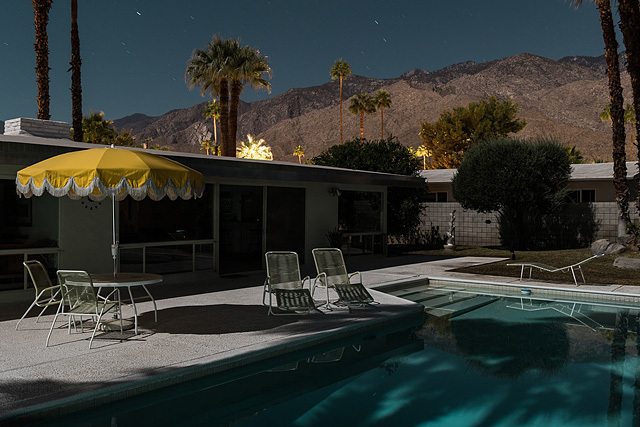 Featured image: 1056 E San Lorenzo Rd III from photographer Tom Blachford's photo series "Midnight Modern".